Sometimes, people living and breathing politics get swept away with how overwhelmingly important their work is. They’re battling for the future of the country, so everyone else must be hanging off their every action. But as anyone who pays attention to polls knows, most people, most of the time, don’t care what politicians are doing. Sometimes the politerati are so isolated from the rest of the country, they’re effectively speaking a different language. This was brilliantly exemplified in my favourite poll question of the year – one that received far less attention than it deserves. The question focuses on the word ‘progressive’. It’s a tough word to define in its current political usage, not least as Cameron’s adoption of the term means it can no longer be treated as code for being centre-left. But it’s fair to say that it is generally used to indicate a desire for reform of public institutions, the removal of barriers to social mobility and an end to discrimination against minorities. It’s not as statist as the old left, nor as resistant to change as traditional conservatism. So according to this definition a progressive politician is someone within touching distance of the political centre – neither a radical leftie nor a bastion of old institutions, nor indeed a rampant free-marketeer. But ask the public who they think is progressive and we get a very different answer. 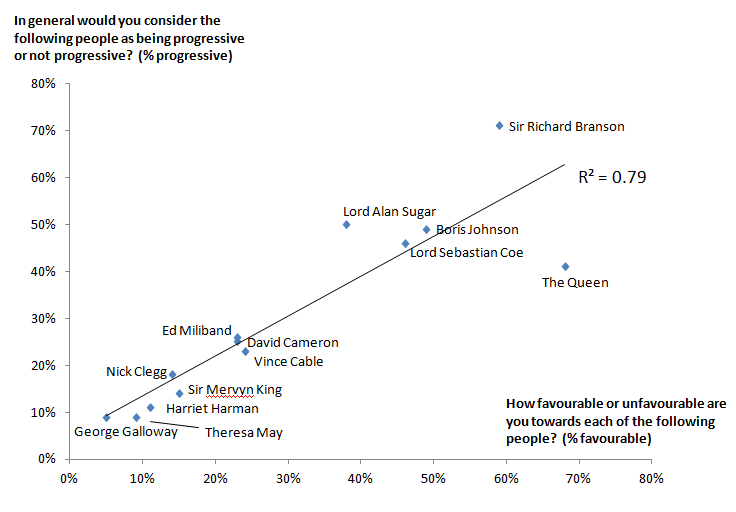 Of the 13 people tested by YouGov, the most ‘progressive’ is Sir Richard Branson. More than twice as many think the Queen is progressive than that Nick Clegg is! What’s going on is that most people are treating ‘progressive’ as a general positive term – perhaps in the sense of ‘takes things in the right direction’. Comparing favourability scores with progressiveness scores shows the two are closely linked: 79% of the progressiveness score is explained by the favourability score.